Every Friday, you'll find Recycled Fashion Finds here on Recycled Fashion, which is coming to you a day late today. You can check out last weeks Recycled Fashion Finds here. I appreciate your submissions and love to see what you've been thrifting or making. A mention for Frugal Down Under's link up last week. Her daughter was invited to a 5 year old Birthday Party. 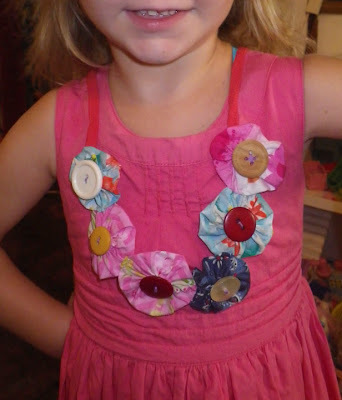 Rather than giving a shop purchased plastic toy, together with her daughter, they made a yo-yo necklace as a gift out of pre-loved clothing and vintage scraps. What a thoughtful and resourceful idea. Wow! This is a wonderful idea, I am sure that girl was very grateful for the gift. What a surprise to see my Dolly peaking from my Blogspot dashboard! Thank you for the write up. I just want to add an adult could whip this cute necklace up in no time. My Dolly is 4yrs old and she's super proud of her achievement. Blogs like this are very inspirational to keep plodding along and not purchase new and to try making stuff ourselves. Look forward to MrsWardy88 hair clip shots.